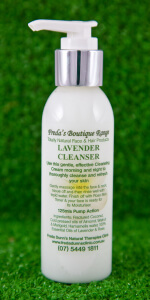 INTRODUCING FREDA’S BOUTIQUE RANGE OF HANDMADE TOTALLY NATURAL FACE & HAIR PRODUCTS. 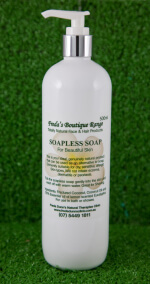 NO SODIUM LAUREL SULPHATE or HARMFUL INGREDIENTS. THE SKIN IS A LIVING, BREATHING ORGAN THAT SHOULD BE NOURISHED AND REJUVENATED, RATHER THAN SUFFOCATED BY CHEMICALS. WHEN YOU USE THESE PRODUCTS, YOU WILL ENHANCE YOUR SKIN AND HAIR BY FEEDING IT WITH PURE NOURISHMENT. WHAT MAKES MOST COMMERCIAL PRODUCTS UNDESIRABLE & INEFFECTIVE IS THEIR INGREDIENTS. FOR EXAMPLE, MANY COMMONLY USED ITEMS IN A COMMERCIAL RANGE ARE POTENTIALLY HARMFUL & CAN CAUSE PREMATURE AGING OF THE SKIN AND ALLERGIC RESPONSES. THERE IS NO DIFFERENCE BETWEEN WHAT YOU EAT, AND WHAT YOU PUT ONTO YOUR SKIN. BOTH WILL GO STRAIGHT INTO THE BLOODSTREAM. THIS RANGE HAS BEEN DESIGNED FOR THE PERSON WHO IS LOOKING FOR HIGH QUALITY SKIN CARE & CHOOSES NOT TO USE HARMFUL CHEMICALS OR PRODUCTS MADE FROM SYNTHETIC INGREDIENTS. This hand made Boutique Range has been formulated by FREDA DUNN. It originated as a result of Freda’s ongoing work in Natural Therapies and her personal search for a Natural Alternative to the chemical formulations and preservatives used in the Commercial brands. Freda is a qualified Herbalist, Naturopath, Dietician and Acupuncturist. She is a Fellow Member of the Australian Natural Therapist Association and the Australian Acupuncture & Chinese Medicine Association. The products are made at her Natural Therapies Clinic at Doonan (NOOSA) on the Sunshine Coast, Queensland where She operates a busy, full time practice.